Last week I turned a year older, and it was rather uneventful as birthdays after 30 tend to be. But there was cake, and that’s all I really care about. I’ve never been much into birthdays. Mine comes at a time when most people aren’t very interested in partying anymore. The days are short and the weather is cool and we’re all exhausted from summer. All I ever really want to do is hunker down at home with a good meal, good wine, good tv, and something good and sweet for dessert. So that’s exactly what we did. 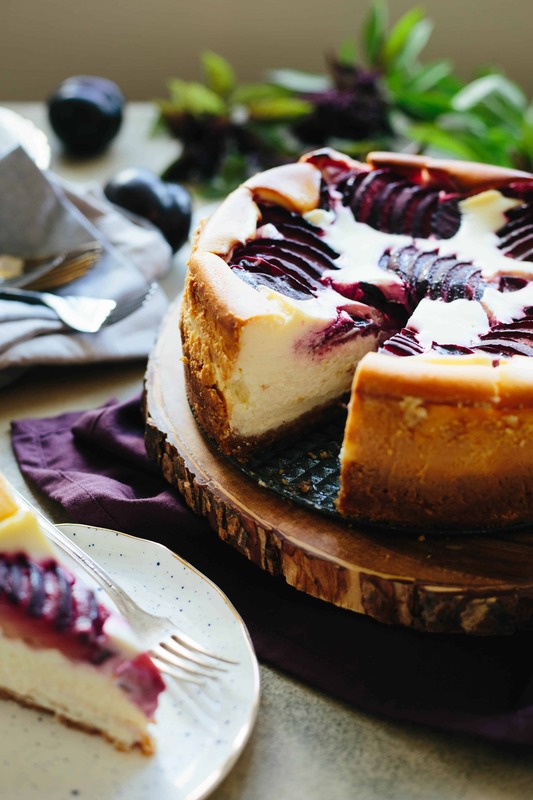 This recipe is a spinoff of my Aunt Ang’s newly famous ricotta cheesecake. I say newly because it didn’t come into her repertoire until a few years ago, but it’s something we now all come to expect at holiday dinners. Ang’s version is simple and perfect, so I’m not really sure why I even bothered to mess with it. I guess I just can’t help myself sometimes. The only real issue I take with the original version is that it doesn’t have a crust, and I am a crust-loving woman. Does it need a crust? No. But does a crust make it better? You bet it does. Any type of cookie crust would be wonderful (gingersnaps would be especially great), but I opted for the classic New York style graham cracker kind. A graham cracker crust, whether there’s cheesecake on top of it or not, is always a good thing in my book. Plums are just about nearing the end of their season along with all the other summer fruits. I have a bad habit of panicking this time of year and stock up on more fruit than I know what to do with. 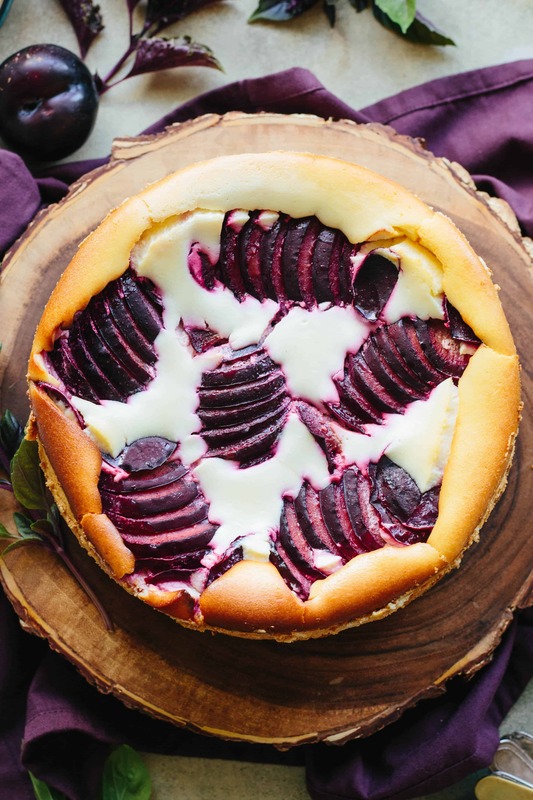 In an effort to not let these pretty purple plums go bad, I thought they might be nice tucked into this cheesecake. Turns out I was right. 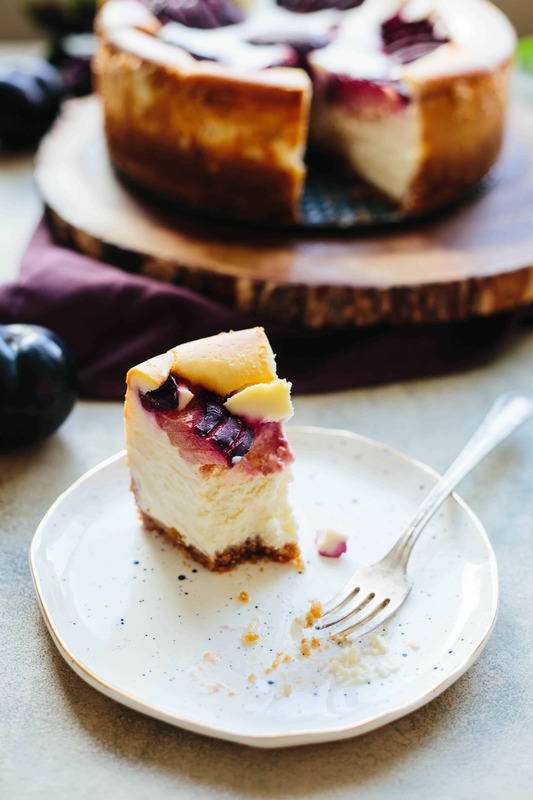 Cheesecakes can be intimidating to make – the water bath, the cracking, the finicky oven temperatures, and all that jazz. 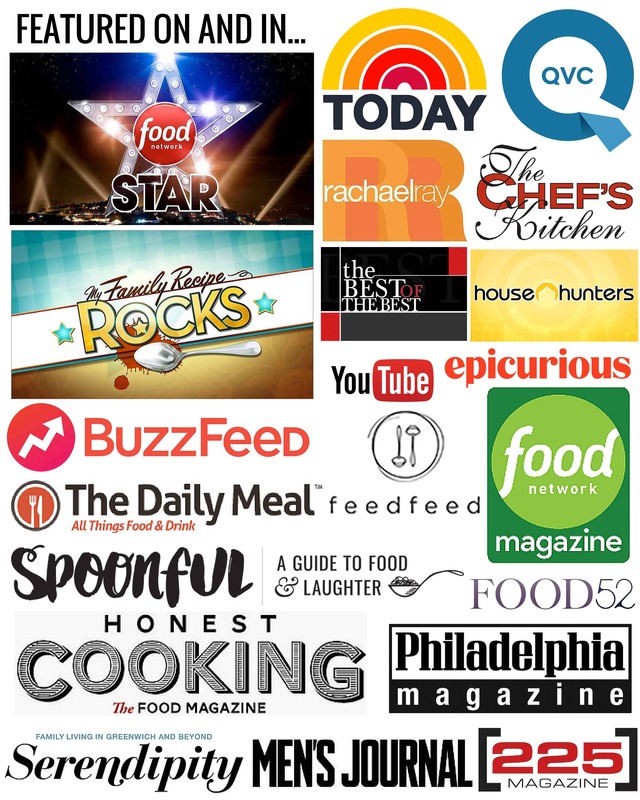 That’s why this recipe is so awesome – none of that stuff really matters. Go ahead and let that bad boy crack. It’s still going to taste amazing, and does anyone actually care anyway? I had the best intentions of sprinkling the top with cinnamon sugar before baking, but alas, I didn’t remember until it came out of the oven. While eating this cake all I could think of is how it would have been better with a slightly crunchy top and subtle notes of spice. I’ve included directions for that addition, and while I haven’t actually tested it, my spidey-senses tell me it’s going to work out just fine. If plums are no longer available where you are, I reckon any other seasonal fruit would be a great substitute. Apples, pears, and persimmon all come to mind. This cake manages to be amazingly light and rich at the same time. It’s so creamy and so flavorful on it’s own, it really doesn’t need all the dressing up that I insist on here. 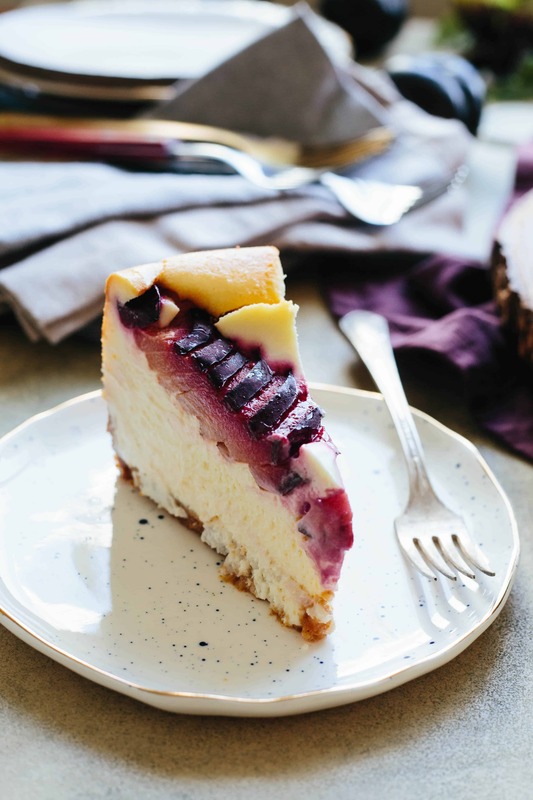 If you are a cheesecake purist, go ahead and make it without the crust or fruit. You’ll just be glad you made it either way. 2 cups (1 pint) sour cream. Mix together the graham cracker crumbs, melted butter and sugar until it's the texture of wet sand. Pour into a 9-inch springform pan, then use the bottom of a cup to press it in to form a crust that comes 1 inch up the sides. Bake for about 8 minutes, then remove from the oven and let cool. Use an electric or stand mixer to beat the cream cheese and ricotta together until smooth. Add the sugar, eggs, 1 tablespoon lemon juice, vanilla, cornstarch, flour, melted butter, and sour cream. Mix until just combined and smooth, but try not to let it whip up too much or it will incorporate too much air. Pour batter over the crust and smooth out the top. Carefully fan out the plums and arrange them in a pretty pattern on top. Sprinkle with remaining tablespoon of lemon juice. Combine remaining tablespoon of sugar and cinnamon in a small bowl, then sprinkle over the cake. Bake at 350 degrees for one hour. The center of the cake will still be quite jiggly. Turn off the oven, but leave the cake inside with the door closed for one hour more. Let the cake cool down, then chill for at least several hours (overnight is best) before serving. 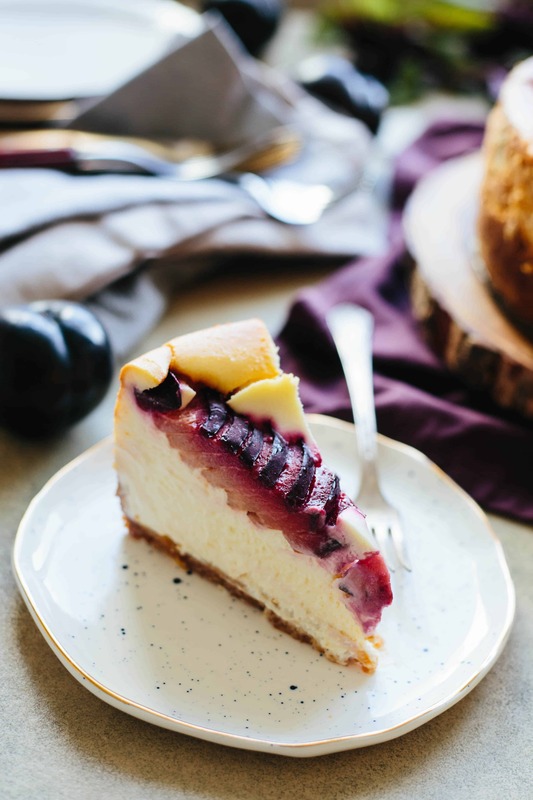 This cake can be prepared the original way by omitting the graham cracker crust as well as the plum and cinnamon sugar topping. I’m with you on the crust. The only cheesecake I’ve ever made is a Jello mix back in middle school. Isn’t that a cryin shame? I promise I’ll fix that. This one’s a beauty, particularly those plums on top. That is a downright crying shame. I highly recommend this recipe with or without the fruit and crust. I’m sure you already thought about it, but I bet mangoes would make an outstanding substitute for the plums. If you try it, be sure to report back! 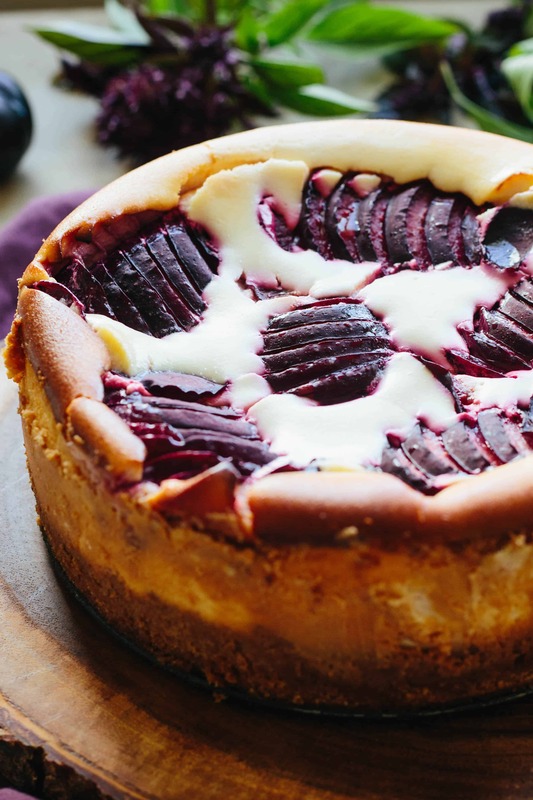 Gorgeous ricotta cheesecake! Definitely on my “to make’ list. Love the plums on top. Thanks Sabrina! It’s pretty epic.